Other Products by Pro Supps. Search other Thermogenics products. 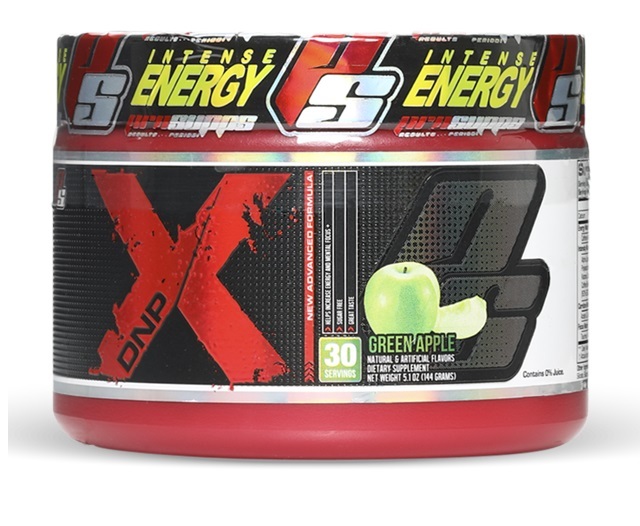 Pro Supps DNPX....its here! If you didn't catch the hype the first time round you weren't in the inner circle, the chosen few, those that got to use the most potent, ultra thermogenic supplement on the market, DNPX. With so much competition on the shelves today, IFBB Pro Art Atwood needed to deliver a stand-out fat burner, a potent fat burner, and a results driven fat burner, and Pro Supps DNPX was born. DNPX delivers a triple punch, it obliterates fat, diminishes appetite and sharpens the mind. If you have fat to strip and think you can handle the fat burner the Pro's use then get on DNPX! Mix 1 scoop of DNPX with 120 - 180ml of water in the morning. Do not exceed 2 scoops maximum in a 24 hour period. This product is gluten free and has not effected my sensitive stomach at all. Two thumbs up. Alpha Lipoic Acid, Garcinia cambogia fruit extract (50% HCA), Lycii berry fruit extract 50% Polysaccharides (Lycium barbarium), Natural Cocoa Bean extract (10% Theobromine), Raspberry Ketone, Citrus Aurantium extract (std. min. 25% Synephrine)(9mg Synephrine)(Kinetiq), Green Coffee Bean Extract (45% Chlorogenic Acids), Dandelion Root Extract 10:1, Green Tea Leaf Extract (60% EGCG), Coleus Forskohlii Root Extract (Standardised to 10% Forskolin). Acetyl L-Carnitine HCL, L-Carnitine Fumarate, L-Carnitine Tartrate. OTHER INGREDIENTS: Natural and Artificial Flavours, Citric Acid, Soluble Corn Fibre, Maltodextrin, Sucralose, Calcium Silicate, Silicon Dioxide, Corn Starch, Tartaric Acid, FD&C Yellow #5 and FD&C Blue #1.